We the parishioners of St. Thomas in northeastern Adams County, a rural parish community since 1860, are ever mindful of God’s bountiful blessings. As baptized Catholics, we believe in Jesus Christ, in Word and Sacrament, and celebrate His good news by living our faith. We become the Christian community that Jesus calls us to be through worship and the activities that flow from it in the areas of word, service and community. By our love and example, working as individuals and as a parish community, we will continue to promote freedom, justice and love. History is a fascinating study, made doubly so when authentic documents reveal the lives and influence of pioneers who have made a great impact on those who come generations after. But, sad to say, the complete early story of St. Thomas church, Camp Point, Illinois, will remain undiscovered – known only to the ages. Records in most cases were unavailable, a few obtained were sketchy at best. And there written history ends. How the church began, why the name was changed, who the founding members were, all these facts are lost. What follows here has been pieced together from the meager available records, jottings from antique notebooks, conversations with nonagentarians in the are of Camp Point, correspondence with former members of St. Thomas, and the earliest copies of the history of Adams County. At the end of 1953 there were 81 persons in St. Thomas mission parish, and the old church could care for them adequately enough. Children, however, soon began to grow and take up more space. New families started moving into the area, and it was quickly seen that within a few years St. Thomas church would be entirely too small. Added to this was the all-important factor that the church, originally converted from a cattle barn, was nearing one hundred years of age and had put its better years far behind. After a suggestion made from the pulpit that the parishioners had better start doing some serious thinking about the future of St. Thomas church, Allen Stout of Camp Point, and Earl Schmidt, R.R.2, Clayton, a trustee of the parish, made a survey and reported that the majority of the parishioners were in favor of raising money for a new church and that about half of them already promised to make a donation towards a church building program, payable over a period of three years. Those pledging support of the new church were: Mr. and Mrs. Jake Ashbaker, Mr. and Mrs. James Baucom, Therese Bolinger, Mr. and Mrs. Maurice Brady, Mr. and Mrs. Henery Broderick, Me. and Mrs. Robert Dempsey, Mr. and Mrs. Cyril Elbus, Mr. and Mrs. emerson Griswold, Mr. and Mrs. Elmer Henning, Mr; and Mrs. Russel Miller, Mr. and Mrs. Donald Obert, Me. and Mrs. Earl Schmidt, Robert Schmidt, Mr. and Mrs. Raymond Schreacke, Mr. and Mrs. Richard Seger, Mr. and Mrs Lawrence Smaith, Mr. and Mrs. Harold Vollbracht, and Lawrence Wever. The total amount of money pledged over a three-year period was $8,500. 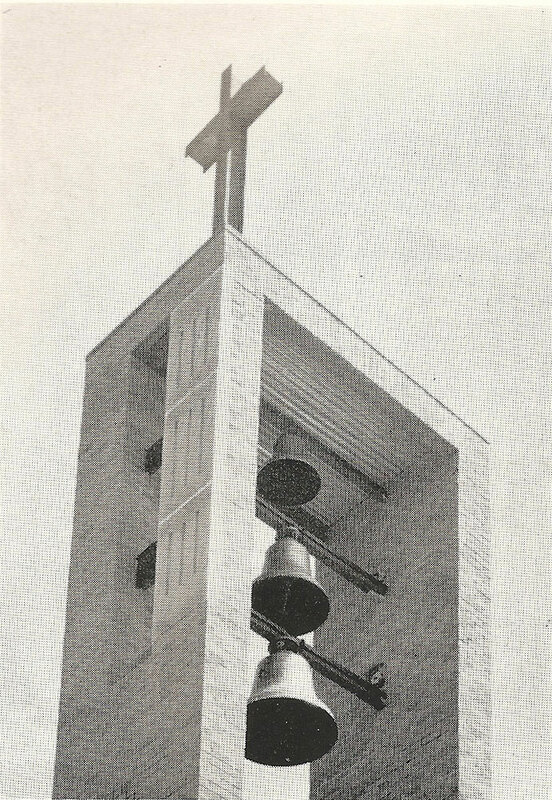 By the end of 1956 the parish membership had grown to 146; was increased to 168 in 1957; and 173 in 1958. Conditions were getting desperate in a church desinged to accommodate only 93 persons at full capacity. On July 1, 1957, the Most Rev. William A. O’Conner, bishop of Springfield, gave authorization to purchase land as a new site for the church. To obtain the right site was quite a problem – and a struggle. All of a sudden, no land was available, and it looked for several months as if the new church would be built outside the village limits, until the members of the village council of Camp Point and Mr. Ross Bowers, real estate agent of Camp Point, were able to secure 4.39 acres of land from Mr. Harold R. Farlow of Camp Point. 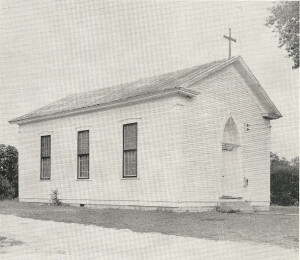 The tract lies two blocks south of Highway 24 at the end of Ohio Street in Camp Point, which street runs directly into the church property. The village council agreed to incorporate this area into the Camp Point corporation limits, to extend water and sewer service to the church grounds, thereby making it an arterial street. This new street is to be widened, graded, rolled and black-topped in the near future. On August 12, 1957, Bishop O’Conner approved preliminary pland for the new church at Camp Point, and on December 19, 1957, the deed to the new church property was recorded in the Adams County Courthouse, Quincy, IL. The deed, involving 61 transfers, began with a land grant made as a bonus to a soldier of West Virginia who had served in the War of 1812, and continues for 86 pages. 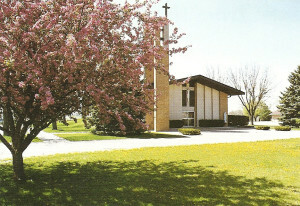 On April 6, 1958, ground was broken for the new church. It was Easter Sunday. Despite the pelting rains, the entire congregation moved to te new church site after Easter Mass and watched John Sommer, former trustee of St. Thomas church and oldest living member of the parish, turn the first spade of earth. John had been confined to his home with illness for almost ten years but he was still able to attend and use the shovel he had bought as a lad of 16 years. John had been confined to his home with illness for almost ten years but he was still able to attend and use the shovel he had bought as a lad at 16 years. Towards the end of March 1959 good weather blessed the project once again, and work progressed daily to the day of dedication. Only one bad incident marred the construction project and that involved a plastering firm from the lower end of the state, on recommended by the manufacturer of the product to be used. After much haggling and wrangling, a new firm had to be employed to correct all the errors made by the first plastering company, thereby involving the Church in over three month’s delay. All errors were corrected, and today we believe we have a beautiful, sturdy Church as a fitting place to worship Almighty God. Since the old Church could no longer hold the congregation and 50 or more people were forced to kneel outside in the grass each Sunday or go elsewhere to Mass, it was decided to start using the new Church on July 26, 1959, even though it was not fully completed. On the day of the first Mass in the new Church, ten first Communicants received their First Holy Communion., from that day on Mass was offered in the new Church each Sunday at 9:30 and on the First Fridays of the month at 6 P.M.
St. Thomas has grown through the years, spiritually, materially and financially. Many young people have moved into the Parish. In 1959 there were only 11 persons over the age of 50 years of age. Kathy Mowen ringing the bells. 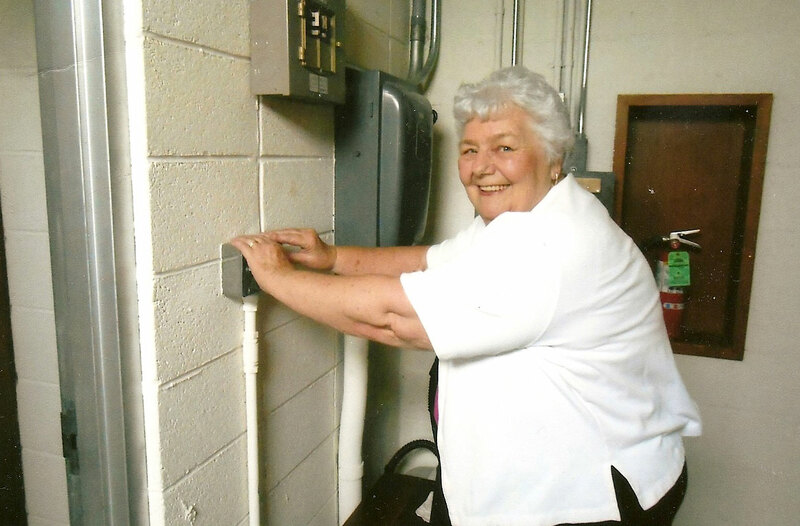 She was instrumental in getting the bells repaired – to ring again.